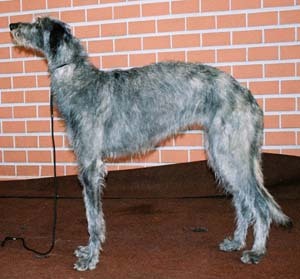 Learn about the temperament and personality of the Scottish Deerhound. Discover what he's like to live with, his traits and characteristics and how he generally behaves. And look at lots of Scottish Deerhound photos. The Scottish Deerhound is very big and tall. He's sweet, loving, devoted and sometimes silly. He's extremely athletic and agile. He's very fast on his feet (you'll never catch him if he gets away) and he has good stamina. He loves to run and romp around outdoors, especially when he can do it with other dogs! He has no road sense and because he loves to run around he can easily run onto the road and get hit by a car (many Scottish Deerhound die from being hit by a car). So be sure he has a safe place to run. His eyesight is excellent and he seems to spot things miles away. He's loving and devoted to his family. He's boisterous as a puppy, but calms down with age. Although he loves to run and is active outdoors, he's lazy indoors and is known for being a couch-potato. He'll spend hours of time sleeping on the lounge each day! He thrives on your companionship and doesn't like to be left alone for long periods of time. He's easy going and not the type of dog to try to challenge your leadership (he's to lazy to). He gets along well with children and is gentle with them. He's aloof with strangers but peaceful with them. He's friendly with other dogs. His chasing instinct is strong and he will chase any small creatures that runs past him (including the family cat). He isn't the type of dog who plays fetch. He might chase the stick or the ball you throw but he won't bring it back. He doesn't bark or make much noise when a stranger approaches your front door, so he isn't the best watchdog. If he finds food on the table he'll eat it without asking! The Scottish Deerhound is moderately easy to train. He learns new commands at the average rate. He is neither difficult nor easy to train. The Scottish Deerhound sheds a fair amount of hair. You'll find hair stuck to your couch, carpets, clothes and everything else in your home.